Mauget’s IMICIDE Hp Liquid Loadable is used by the USDA, city and state governments in prevention and eradication programs for Asian and Citrus Longhorned Beetles, with over 500, 000 trees successfully protected. Since 2000, the USDA lists IMICIDE as the only trunk injection product in their APHIS Emergency Domestic Program for control of the Asian Longhorned Beetle. Research has also shown that Imicide to be one of the most effective preventative and control treatments for the Emerald Ash Borer. 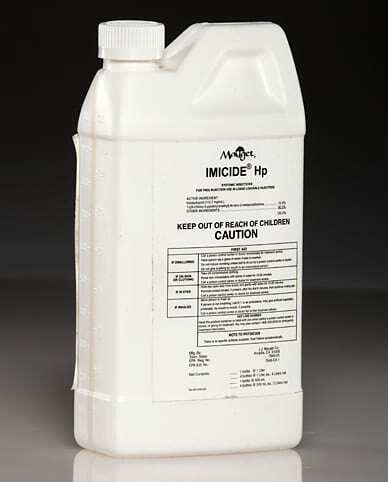 Imicide Hp is available in high volume one liter bottles for most all re-loadable injector equipment. It has been the only tree injection product used by the U.S.D.A. on over 500,000 trees in their Asian Longhorned Beetle emergency program. 1 liter bottles and 1 liter round bottom bottles.